When you are viewing a group's channel, you have options to view "Followers" and "Members" by clicking on the drop down menu underneath your connections. To understand groups, it's important to understand a few key terms. “Group Administrator” is someone who follows or is a member of the group, has access to download the group's metrics, and can also add and remove vidscrips from the group channel. You can make a member a group administrator by clicking the drop down arrow next to their name and selecting "Make Group Admin". An administrator does not have to be included in the group metrics. 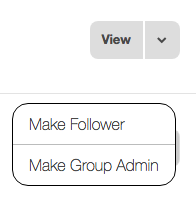 You can convert any group administrators who may be members over to followers so that they are not included in the metrics by clicking the drop down arrow next to their name and selecting "Make Follower". "Members" are the individuals who are actively members of your group and therefore are included in group metrics. "Followers" merely just follow the group, so they are not included in group metrics. You can make a follower a member at anytime by clicking "Make a Member" (in red letters) next to the individuals name.